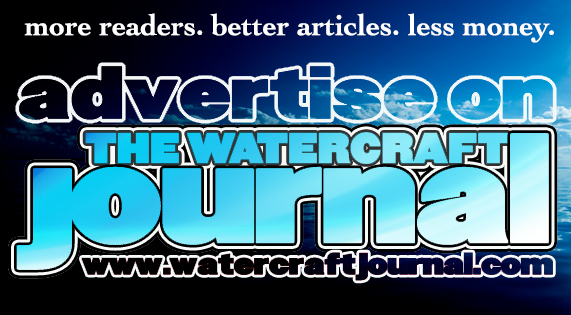 Real Review: Aquacart AQ-19 Cart & Service Stand | The Watercraft Journal | the best resource for JetSki, WaveRunner, and SeaDoo enthusiasts and most popular Personal WaterCraft site in the world! 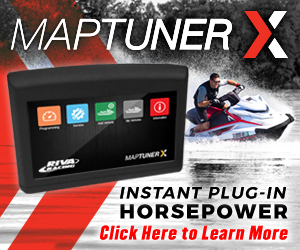 Unless you’re either of the position of living in a temperate climate that never sees snowfall or requires the winterization of your watercraft or can afford to hole up your PWC in a private storage facility, chances are you’ll be storing your slumbering ski in your home garage or storage shed while the skies gray and the weather turns to crap. It’s an unpleasant inevitability, so we’re thinking of the best tools and tactics to make the transition from weekend hot rodder to hibernation. Highest on our checklist of necessities for the off-season was a shop cart that would not only provide us a comfortable height to access our engine as we plan on tinkering all winterlong on our project ski, but be able to roll smoothly over our garage’s less-than-perfect surface without catching or jamming. 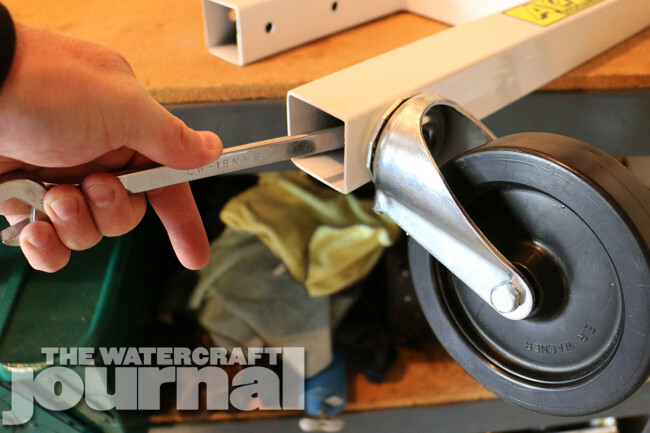 These might sound like minor “must haves” but once you’ve nearly topped a runabout because a low-quality caster catches on a loose bolt, you’ll feel the exact same way. Above left: The complete AQ-19 cart comes in 9 pieces with all the hardware you’ll need. Above right: The large 5-inch 4-axis casters mount to each end of the 28-inch wide base. Initially, we approached Aquacart wanting their lowest-slung runabout cart because we hated the idea of climbing up and over our Sea-Doo Spark all season. Thankfully, wiser minds prevailed. 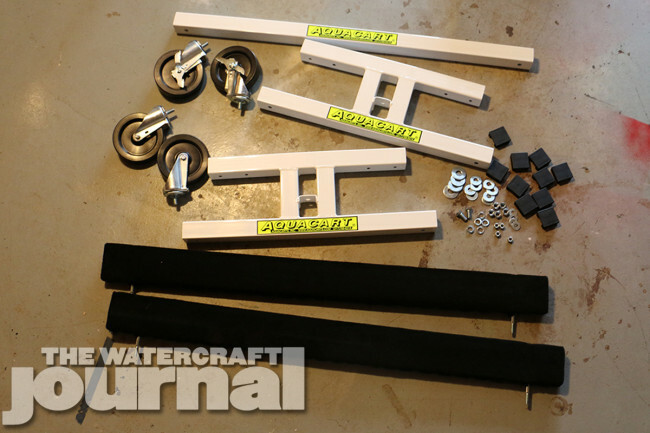 Aquacart’s Rob Towner convinced us that the AQ-19 was ideal for what we were looking for, particularly as the AQ-19 was, as he said, “a great height for using with trailers.” Only after an hour assembling the Aquacart AQ-19 did we learn firsthand exactly what he was talking about. Our Spark slid almost effortlessly from our single-place trailer onto the 48-inch long black premium marine-carpeted bunks. 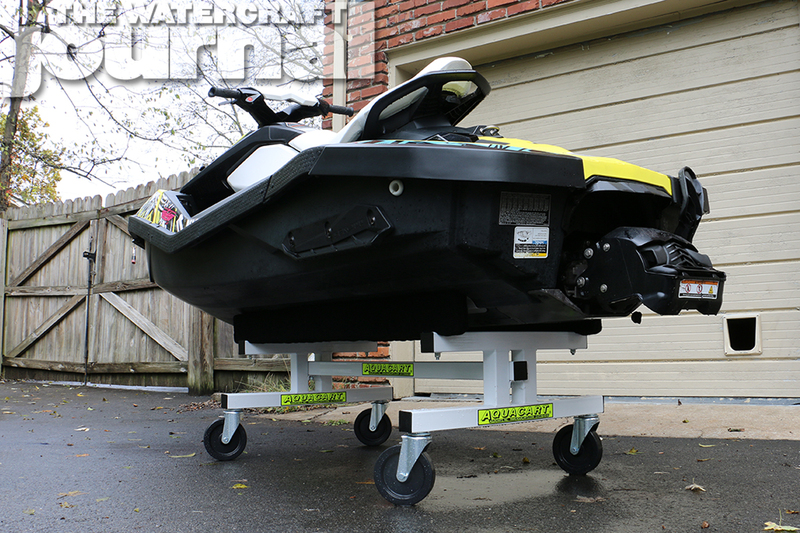 The cart’s 19-inch height is measured to meet most PWC trailers, earning the AQ-19 its namesake. 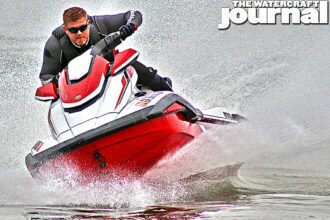 Of course, the featherweight Sea-Doo Spark’s 400-pounds doesn’t strain the AQ-19’s 1,300-pound weight restriction, and with a choice of 14- or 20-inch wide bunk spacing adjustments, the Spark fit comfortably on the widest setting. 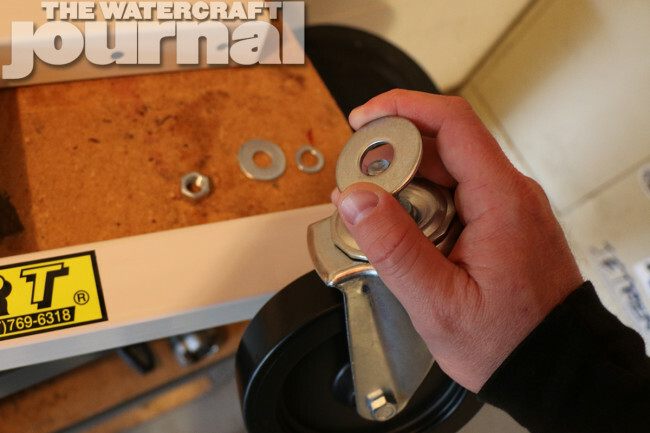 Above left: A 19mm boxed-ended wrench is all that’s needed to tighten down each caster. 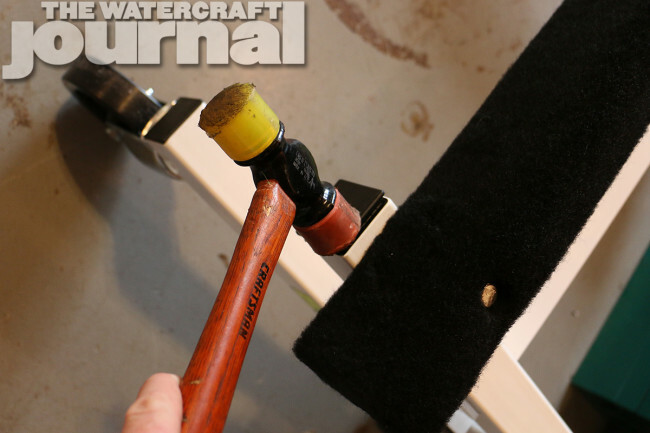 Above right: Aquacart also includes these nice black plastic end caps to protect you from sharp edges. Prior to assembly and use, we were immediately impressed with the AQ-19’s build quality upon arrival. Built from heavy-duty 2-inch 14-gauge steel square tubing, each of the components come professionally finished in powder coated bright white (the powder coating being significantly more durable than conventional paint and corrosion resistant) – and if you’re looking for a dash of color, Aquacart offers other hues upon special request. In fact, the finish is so nice on these carts that they’re not just intended for storage or shop use, but also for showroom display. Towner provided us dozens of examples of dealerships and custom hull makers using these carts in their displays and across their showroom floors – many using the same carts for years without showing any sign of distress, patina or discoloring. Above left: The center support mounts to opposing perches on the H-frames. Above right: The carpeted bunks also have long bolts that run through the H-frames and are fasted down before adding the final end caps. The basic frame assembly consists of two wide footprint 28-inch H-frames, a center spine (or support), two pressure-treated wood bunks – with the inside edges beveled to reduce additional wear on the carpet – and wrapped in the aforementioned marine carpeting. Assembly takes a skilled mechanic mere minutes. We needed a while longer to snap pictures along the way (and we skipped a few steps, so this isn’t a step-by-step tutorial on how to build your AQ-19, sorry). 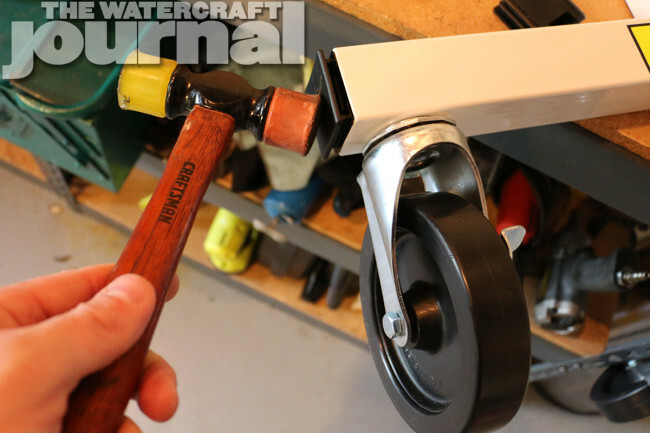 And to our pleasure, the AQ-19 includes four-axis, 5-inch diameter swivel casters. We opted for the optional caster wheel brakes as we knew we’d be crawling all over the ski in the coming months, and although Aquacart offers optional 6-inch casters with an impressive 1800-pound rating, we knew the standard 1300-pound rated casters would work more than enough for our PolyTec Spark. 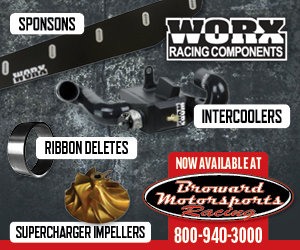 Above: Our Sea-Doo Spark slid effortlessly from the trailer to our Aquacart AQ-19 and maneuvered through our garage without any trouble – or down the garage approach and across the asphalt driveway. The best way for us to evaluate our AQ-19 was by pushing it laden with our Sea-Doo through some tight spots around our tool bench, riding lawnmower and car all parked in the garage. From there, we rolled the Spark out (and down the approach) of the garage and across the driveway. From treated concrete to asphalt, the big 5-inch casters rolled over the surfaces easily, the Aquacart never feeling tipsy or unsteady. Climbing up onto the ski, leaning forward over the bars to access the front bin or crawling down the back, the casters’ wheel locks didn’t fail either. 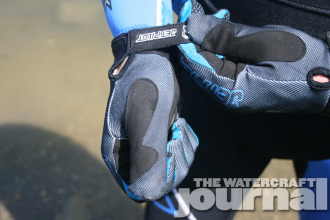 Obviously, we’ve got quite a few months more of testing ahead of us, so some might consider this review slightly premature, but we’re already pretty certain this was one of our smartest purchased. 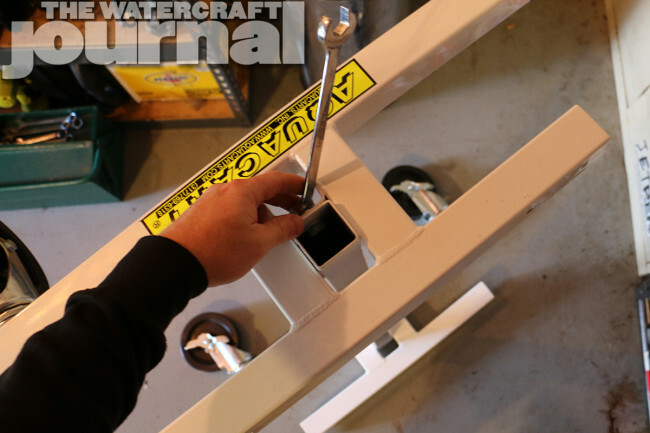 Priced at $234.95, the Aquacart AQ-19 is the ideal shop cart for the home garage, the professional shop or dealership. We know, we’ve seen already seen them there! 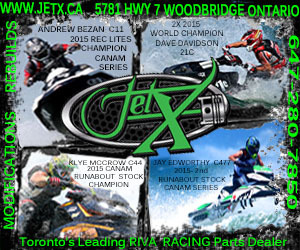 The Watercraft Journal Welcomes Jettribe For 2015/2016!